Home Bumper Recyclers What is bumper recycling? Just about any automobile accident results in damage to the bumper. Rather than pay for a brand new, expensive bumper cover, insurance companies would prefer to have the bumper repaired. However, body shops often do not have the expertise, the time, or the desire to repair plastic bumpers. What many body shops will do is hire out their weaknesses and call a bumper recycler. A body man (or woman) may be able to repair a bumper, but it is not something that he (or she) does everyday. Body men (and women) have to know a lot... frame straightening, panel beating, estimating, paint mixing, steel welding, aluminum welding. Having to repair plastic bumpers is something that body men (and women) shouldn't have to know, too. With bumper recyclers, there is one less thing for the body man (or woman) to have to learn. "Bumper Recycling sounds interesting. How much money can I make?" You can make a living recycling bumpers. How much you charge for a bumper depends on the cost of a brand new OEM bumper. Most bumper recyclers charge body shops about 50% off of the OEM list price for a bumper. So, if a brand new bumper costs $400, you would sell your recycled bumper to the body shop for about $200. "That sounds like pretty good money. How many bumpers can I recycle in a day?" You should plan on 2½ to 3 hours per bumper. So, if you work 8 hours a day, you could probably recycle about 3 bumpers per day. "So if I recycle three bumpers per day and I sell them to body shops for $200, then I can make $600 per day?" Not so fast. While it is possible, there are other things to consider. Remember, you need to pick-up and deliver bumpers too. This cuts into the time available for repairing bumpers. Also, remember that you are charging 50% of list price. So, if the body shop needs a bumper that lists for, say, $120 and you charge 50% of list, then you will only make $60 for that bumper. "What are the costs involved in recycling a bumper?" 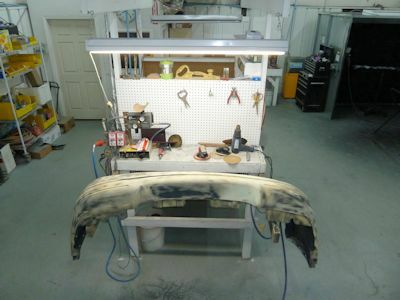 Your direct cost of recycling a bumper are the repair materials and labor. Plan on sinking about $8.00 worth of materials into each bumper. This includes epoxy fillers, welding rod, sandpaper, spot putty, primer, etc. Plus, some body shops want you to give them $5.00 to $10.00 for each bumper you take from their shop. So, it is conceivable that you could have as much as $18.00 of materials in each bumper. The labor costs is going to be your biggest direct cost of recycling bumpers. Let's say that you think your time is worth $30.00 per hour and you spend three hours on a bumper. Now, in addition to the $18.00 worth of materials in the bumper, you now have $90.00 worth of labor in the bumper, for a total of $108.00 of time and labor in the bumper. "That doesn't sound very promising if the bumper only sells for $60." Don't be discouraged. First of all, you probably wouldn't bother recycling a bumper if it is only going to sell for $60. You may decide not to recycle any bumper that you can't sell for at least $100. You will find that your average selling price is about $190 each (As of February 2012). Also, you could hire someone (part-time maybe) to do some of the labor for, say, $20.00 an hour (including benefits). And, there are things you can buy to make the time per bumper much lower. You could use a bumper identification and bumper inventory management service (like www.dbumper.com) to reduce the amount of time searching for and identifying bumpers. You could buy a blast cabinet to cut down on sanding time, work stations that improve productivity, etc. ; so your time spent per bumper could average only 2 hours... or less. Now let's do some new math. Time per bumper: 3 hrs. Also, keep in mind that it may take several months to work up to this level. It takes 4 to 8 body shops (depending on the size of the shop) to keep one man busy full-time. You will need space to store the bumper covers. Having 3,500 bumper covers in stock should cover about 70% of the bumper covers that body shops are looking for. 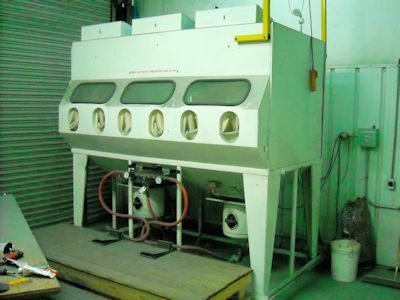 A blast cabinet will probably be your biggest time saver, but it is also one of the largest investments. A blast cabinet that is large enough to contain a bumper cover is very expensive. Not only that, but you will need a big air compressor to run it. 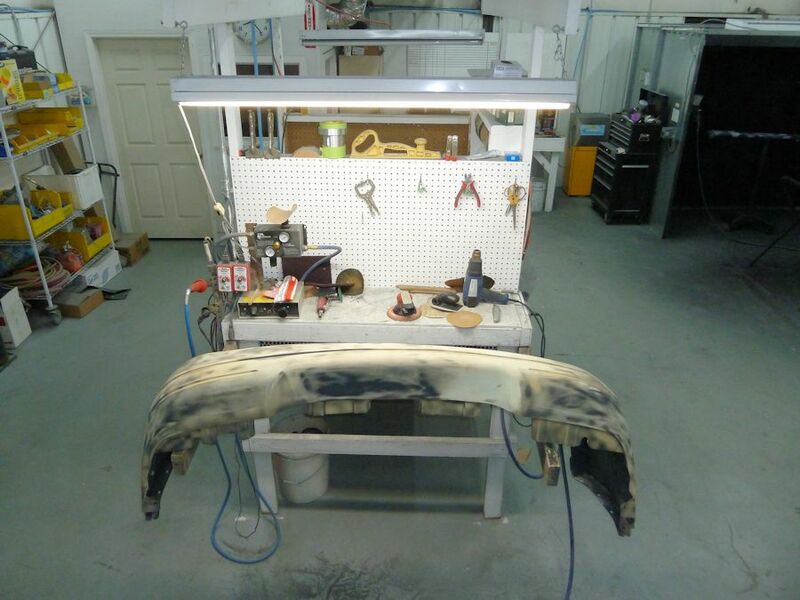 An efficient workstation will dramatically reduce cycle time for refurbishing bumper covers. You may want to consider taking our training course where you will learn a lot about the bumper recycling industry.